As an athlete, you know that nutrition is an important part of your performance. Fueling with the right foods is a key part of your training strategy and you’re always on the lookout for “superfoods” that can help elevate your game plan to new levels. One such superfood, salmon, is most commonly touted for its heart health benefits, which of course are important to athletes, but this nutrient-packed power-food’s health and fitness benefits don’t stop there. According to Kim Larson, R.D., C.D., CSSD, spokesperson for the Academy of Nutrition and Dietetics and founder of Total Health, not only is salmon one of the best sources of protein for athletes, but the health benefits derived from one of its main components, omega-3 fatty acids, are exceptionally abundant. Additionally, Larson explained that omega-3s that come from marine sources are most beneficial because they are easily absorbed and used by the body. What’s more, Larson says that research has also shown that omega-3s like the type found in salmon are effective for preventing and treating depression. A few more health benefits that are likely of particular interest to athletes: according to Larson, omega-3s act as potent anti-inflammatories, reducing inflammation at the cellular level, which can also help lessen pain and soreness caused by inflammation. Plus, salmon is also high in vitamin D, an important nutrient for maintaining strong, healthy bones. That’s not all salmon has to offer for athletes, though. Larson says the list of benefits goes on still. 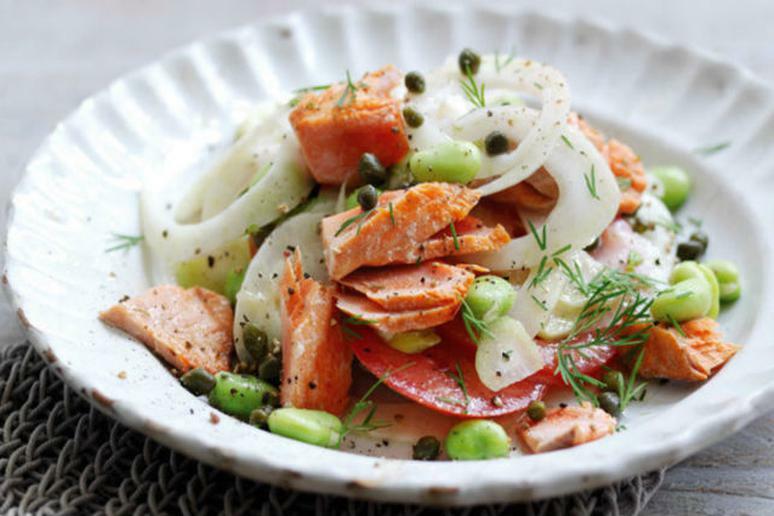 To compose a truly healthy meal and reap the most nutritional benefits, Larson suggests broiling, roasting, sautéing, steaming or poaching your salmon. Oh yeah, and then there are the B vitamins found in salmon, too. So yes, salmon is indeed a powerful superfood and one that’s especially beneficial for athletes and even everyday exercisers who want to perform at peak levels. Of course, salmon and the nutrients it offers are only one part of a large nutrition picture, though. So, to help you fill in the gaps, Larson offers the following important fueling tips. Eat enough protein throughout the day to provide the amino acids needed to help repair and rebuild the muscle that is constantly being used in training. That includes breakfast within an hour of waking. Pre-hydrate before an event or race by starting hydration at the start of your day—right when you get up. Drinking enough fluids to prevent even slight dehydration will help maximize training and performance. Drink enough fluids to equal half your body weight in pounds. If you know your sweat rate, for every one pound lost, replace that with 24 ounces above and beyond your usual fluid intake. Eat every three to four hours, making easy and quick meals with snacks in between that are nutrient-rich. This ensures you’ll get all the calories and nutrients needed for energy and health. Fish is a great option because it cooks so quickly and easily. You can even cook it frozen. Making salmon patties for dinner with canned salmon is easy on the budget, equally nutritious as serving fresh, wild salmon and is a convenient pantry staple. A final world of advice: if you want to ensure you’re consuming the freshest, most nutritionally-dense salmon, Larson says choosing Wild Alaska salmon is one of your best bets. Wild Alaska’s harvest season began on May 14 and is anticipating one of the highest runs of salmon in approximately 20 years, which means you’ll likely find more frozen, canned and fresh Wild Alaska salmon in the marketplace. For easy and creative recipe ideas, check out the Ultimate Guide to Wild Alaska Salmon.